Fat Flakes #1220 Jeanette Crews Designs Snowmen Cross Stitch Pattern Book. Condition is New. Shipped with USPS First Class Package. "35 Cats," and "56 Cat Breeds.". Both are "One Nighters" by Jeanette Crews Designs. Both are about 8 1/2" x 11". There are old price stickers on the covers. Black and white charts. JEANETTE CREWS DESIGNS 2005. X-PLORE -TUSCANY. BEAUTY OF TUSCANY AFGHAN. TUSCAN LANDSCAPE ARCH. CROSS STITCH BOOK. I also have many other Out of Print & Rare Cross Stitch listed. Take a Look! OLIVE WREATH TRIVET. Jeanette Crews Designs, Inc. Special Occasion By Dale Burdett Designs And Borders. Over 500 Designs & 200 Borders. Book 10. Excellent Condition. Jeanette Crews Designs. COUNTED CROSS STITCH PATTERN BOOK. Cross Stitch Pattern Book Snow Folks at Home by Alma Lynne Ornaments Christmas. Condition is New. Shipped with USPS First Class Package. I also have many other Out of Print & Rare Cross Stitch listed. Take a Look! For Girls Only.". These patterns can be stitched on 14 ct. aida (not included). These are the following patterns to stitch Good Work Son. This is for the. I Love You Dad. World's Best Dad. Jeanette Crews Designs One Basic Book Mark New. Condition is New. plain book mark! Shipped with USPS First Class Package. Booklet Contains - 20 different design charts. Special Occasion Designs & Borders By Dale Burdett Book Ten/700 Designs. Condition is Used but in good shape. Comes from a smoke and pet free house. Contact me for any additional information or questions. Retro Kitchen.". These patterns can be stitched on 14 ct. aida (not included). These are the following patterns to stitch bowl napkin holder. button clock. floral bread cover. cherry towel (towel not included). In excellent condition. See photographs for designs. Photographs are of actual item you will receive. 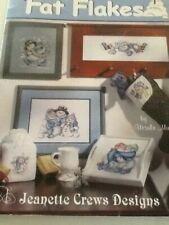 This is a counted cross stitch pattern book from Jeanette Crews Designs entitled "The OmniBook, Work, 15th in a Series". It shows minor edge wear. 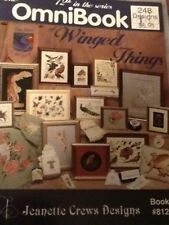 This book has cross stitch patterns for all kinds of different jobs and professions. A brand new book that I intended to use, but now realize my project list is much too long! This is really a great set of patterns and you won't go wrong bidding on it. Non smoking home. Cross Stitch Pattern book #803. shelf wear to cover. good condition. Jeannette Crews Designs, Inc. No Exceptions. by Susan J. Heiss. Jeanette Crews Designs, Inc. - Printed in 1997. - It's a Cover Up!". - Cross Stitch Pattern Book. You never know what you might find! This is a softcover book - 8 1/2" x 11" - Contains 10 pages of photos & complete instructions to make 18 projects. This is a 10 page, soft cover book with insect patterns to stitch along with a beautiful color cover. Inside are black and white patterns. There are no marks, tears or writing in this at all, just price stickers on the front cover. Printed in 1997 by Jeanette Crews Designs, Inc. - #22137. "Four Seasons Angels" - Cross Stitch Pattern Book. You never know what you might find! This is a softcover book - 8 1/2" x 11" - Contains 18 pages of complete instructions to make all designs shown in the photos. This pattern leaflet is used and is in very good condition. I have an Omnibook of Babies - Book #804 - of Counted Cross Stitch Patterns. The book is complete. In condition pictured. Pattern has some wear from handling. There is no writing, highlighting, stains or damage to the any of the charts. There are 17 pages in the book. Charts are in black & white & easy to read. Blue Sailboat & Pink Quilt Square. Baby's Sleeping. I Love My Mommy. PATTERN BOOK ONLY , not the finished item or any supplies needed to complete these patterns. These are the following patterns to make. This is pre-owned in good condition. We only have this one available. Mild shelfwear to booklet. 26 Mini-Pull designs for all occasions. I have had this book in my collection for several years and just never used it. This pattern book is used and is in very good condition. Baby Sleeping / Baby Awake. Bear & Duck Wash Mitt. Rain Bear Hooded Towel. Bear Booties. Honey Bear Bib. Rocking Bear Bib. 1994 by Jeanette Crews Designs. Following my mother-in-law's passing, I have accepted the challenge of finding interested crafters for her varied crafting stash. I WILL note any defects or odors I detect. Sleeping Kitty. Kitty in a Box. One Two Three. I Love My Mommy. I Love My Daddy. I Love My Grandma. PATTERN BOOK ONLY , not the finished item or any supplies needed to complete these patterns. Nine page leaflet in good condition, this leaflet has been handled and shows wear around edges. 213 Amazings Designs From Jeanette Crews. They are all new & unused.